To fully embrace and enjoy the outdoor environment in your home, you need places for seating and areas for congregating. To adequately design these spaces, two main questions need to be addressed. Where should these be located and for what purposes are they created, meaning, what do the users want to accomplish in these spaces. Oftentimes, we create different areas for different purposes, yet all inter- connecting in space and time with a unifying design aesthetic. Some seating areas are designed for contemplation and solitude, while others are for chatting with friends and still others for larger group settings. Practical factors like shade and screening, proximity to water and other prominent features all play a role and influence the final design and location of these special outdoor rooms that make up your expanded outdoor environment. 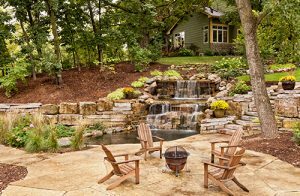 Here at IVY Studio, a landscape design and build consulting firm in the metro Boston area, our design professionals are experienced at creating outdoor environments that burst with creative energy, are practical and sensitive. Contact us at 781-591-0300 or vern@ivystudioMA.com to see how we can work with you in creating a one of a kind outdoor oasis featuring unique seating and gathering spaces.